As some of you might have heard, we have gotten a wee bit of snow here in Durham, NC last week. The total around my house was 8 inches, which for the south is as close to the end of the world as you can get. My power went off, then back on a few times, but it was the loss of internet that was staggering to me. Not only does that stop the production of custom cards, but also my posting ability! There were so many topics I wanted to discuss, but in the end I forgot some of it and others are now not worth mentioning. I did have some things I wanted to mention. Another of the mini 1959 Wad Wax Heritage Minis came back. 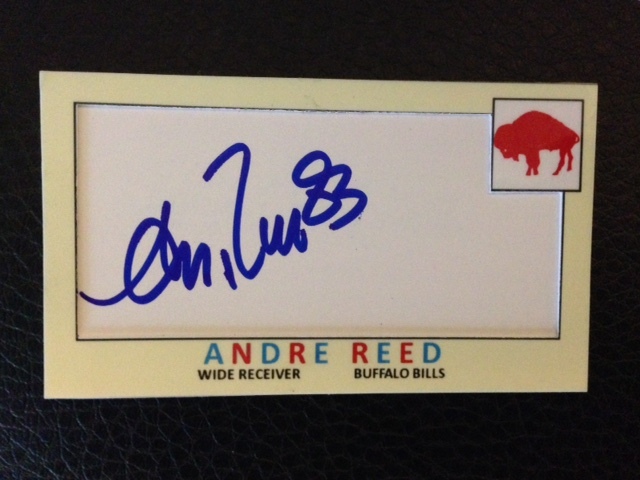 This one from newly elected Hall of Fame member Andre Reed. Reed should have been in the Hall of Fame years ago in my opinion. His ability to stretch the field might very well be unmatched in Buffalo Bills history. With 951 receptions and 87 career touch downs, the man sits high among the all time greats. As such he finally gets what he deserves, a bust in Canton. These are the next four to go out. They actually went out this morning. 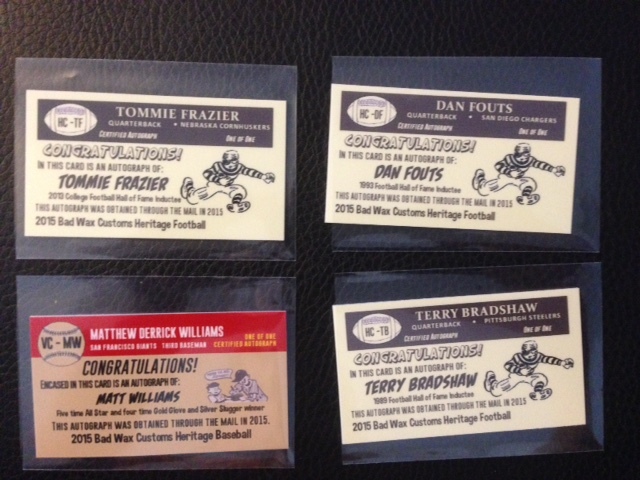 Mostly football but with a string of recent successes of Matt Williams, I had to add another one of my 80s cardboard gods. Tommie Frazier – One of my all time favorite college quarterbacks. he was recently inducted into the College Football Hall of Fame. Saw one TTM success and decided to go for it. Really excited to get this one back, he was up there with Michael Vick as one of the most electrifying players in college football history. Dan Fouts – My Charger himself, a regular gunslinger from the 70s and 80s. I used to love watching him toss the ball around. Another HOF member that I have to have in my collection. Terry Bradshaw – Still my favorite Sunday football analyst. He was a pleasure to watch both on and off the field and his 1977 card was my first real valuable card that I put in a top loader. I was six at the time. Matt Williams – One of those late 80s guys that I had a ton of rookie cards of. May have not been the best of his generation, but a damn good player that was probably one of the most reliable players of his generation both offensively and defensively. Currently managing the Washington Nationals. Most of these should come back within 30 days. 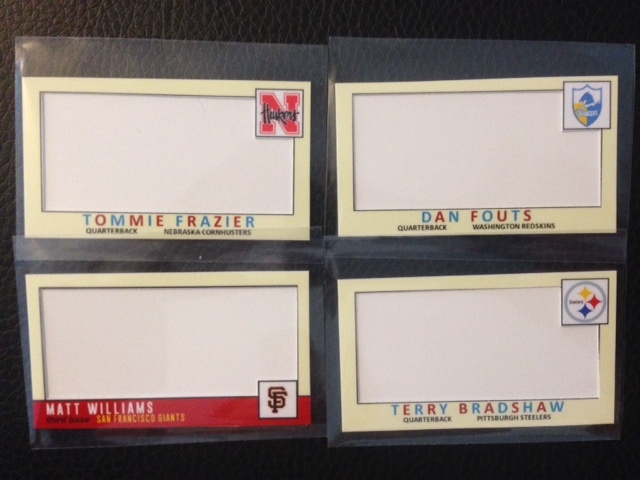 The idea behind this one was to come up with a vintage looking design that would resemble the 1959 Topps Football. I went with the vintage cream boarder. 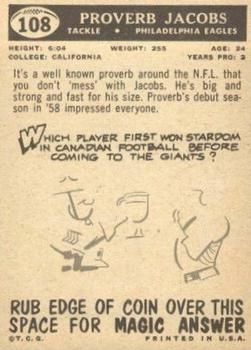 The name of the player with alternating blue and red lettering. I placed the team logo in the top right corner, simply because placing it on the left would leave a bit cramped for the player to sign left to right. Also had to offset the logo box so that it was not in the corner like some of my previous templates. placing it in the corner of the autograph box would leave almost no room for the signature on one side. Then went with position and team text on the bottom. Again theses are done using business cards, (hence minis). As for the back of the card, I tried to also keep it similar to the 1959 design’s back. 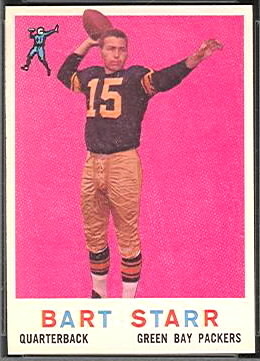 Open football icon in upper left, full player name, position, and team in black (grayish) bar. Went with the shadow letters for the “Congrats” to mimic the first letter in the player bio on the back of the 1959 Topps design. 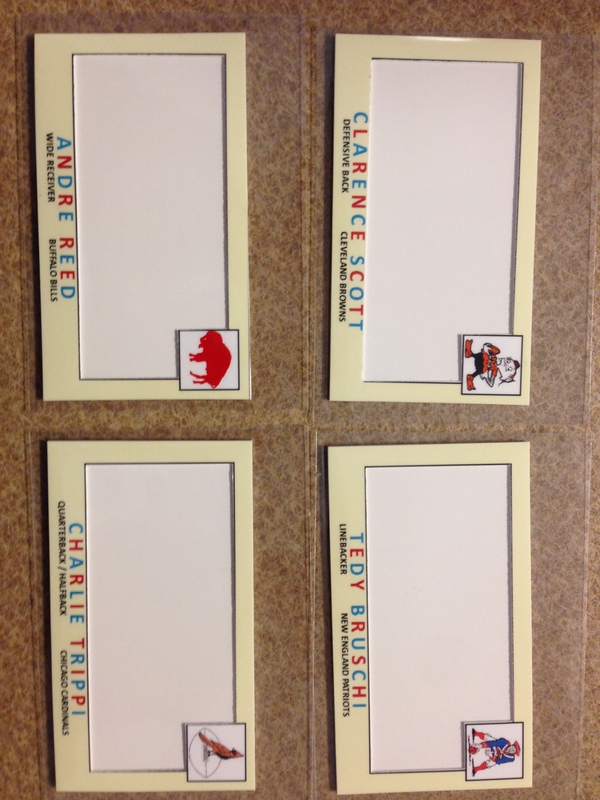 The rest of the caqrd, I flat out copied off of the baseball mini design, with the exception of the football guy. I tried to put in a franchise question like you would find on the original card, but there just was not enough room. But with nothing in that corner, I wasn’t sure what to do so I dropped the retro football guy in there. Tedy Bruschi – I went to the University of Arizona at the same time as he did. I had is autograph on a ticket from the U of A – Washington game where the Wildcats beat the then number one Huskies. So this one was a no brainer for me. I also feel as though his play was Hall of Fame worthy, but I am biased. Clarence Scott – All Pro defensive back for the Browns. 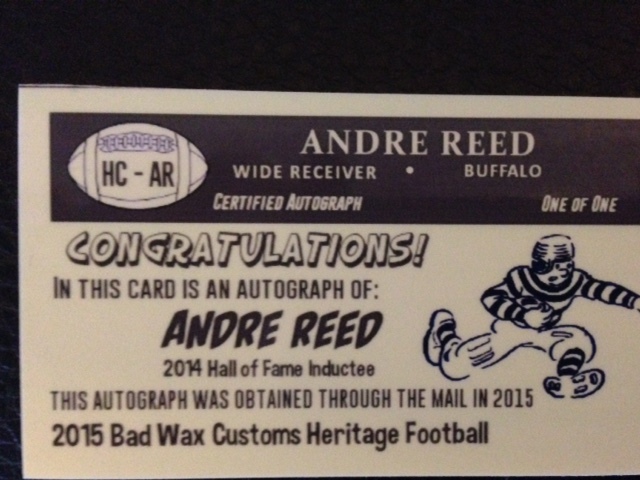 Andre Reed – 2014 Hall of Fame inductee. Charlie Trippi – 1968 Hall of Fame inductee, also member of the College Football Hall of Fame. Tried to go with the retro logos if I could. Very excited about this lot of requests. They all fall in my All Pro or HOF requirements for players. Will let everyone know when they start coming back.